Plunging temperatures, icy conditions and snowfall present a number of risks for pet cats, particularly those cats who like to wander outside. Even a heavy frost can be taxing for cats. When your cat comes in from the snow, wipe off any road grit and any other substances that may stick to his paws or fur. Keep the doors of sheds and outbuildings shut or wedged open, so that cats do not become trapped. Cats may also climb into vehicle engines for warmth whilst out roaming. Be vigilant, and check under the bonnet of your vehicle before starting your vehicle. Provide some shelter for cats that have access outside, such as a designated shelter, or cardboard box partially covered with plastic sheeting. Take special care of your cat if he has arthritis, as the cold can severely affect inflamed joints. Provide additional warm and comfortable places for your cat to rest or sleep. If your cat is finding it hard to reach his favourite resting places then look at ways of making it easier for him to reach his preferred places. Also ensure he can easily access his chosen toileting site. If your cat uses an outdoor water source to drink, make sure it doesn’t freeze. Always have clean, fresh water available inside in case the outdoor source is inaccessible. 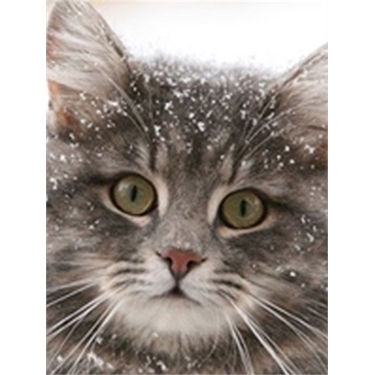 If your cat is seeing snow for the first time, then consider letting your cat wander in a safe and enclosed area such as a garden, and accompany them when they do. If you should let your cat wander further, then let them outside when temperatures are highest and traffic levels are lowest. Also, check your cat flap regularly to ensure it hasn’t frozen over or become blocked by snow. Keep your cat in during the hours of darkness when there is a greater risk of cats being involved in road traffic accidents, theft and physical attacks. If you haven’t done so already, consider taking out pet insurance for your cat in view of the risk to your cat posed by the winter weather. Keep containers of anti-freeze in a safe and secure place - cats will drink it but it is poisonous to them, affecting the kidneys, liver and the brain.